A well of moisture for your skin: hyaluron molecules quench your skin’s thirst, restoring moisture to its top layers. Contains soothing panthenol for an even tone. Ideal for combination or oily skin. 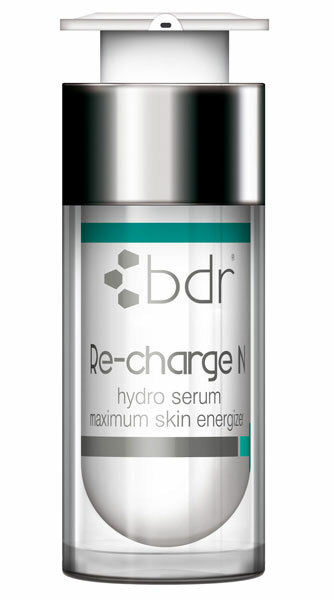 Re-charge N’s concentrated, ultra-fine hyaluron molecules make it unique on the skincare market. This intense hydroserum enhances regeneration and accelerates cell division. Skin doesn’t just look younger – it is younger! Re-charge N delivers and locks in moisture immediately, activating ATP production. Within 3-4 weeks, the hydro-lipid layer is completely rebuilt. 100% free of parabens, PEG’s, paraffin, emulsifying agents, fragrances and dyes. Suitable for all skin types, and ideal for sensitive, allergy-prone skin. Use mornings and evenings after cleansing. With a high concentration of active ingredients. HYDRACTIN® COMPLEX: Stimulates the cell’s energy production and improves cell metabolism. The hydro-lipid coating is rebuilt. Trans-epidermal water loss is reduced creating an excellent moisturizing effect. Skin regeneration and elasticity is promoted. A brilliant serum with a balanced blend of exceptional, biotechnological high-tech IDCs, creates a complex, multilayered deceleration on skin aging processes, significantly alleviating signs of aging and simultaneously activating all skin repair functions. Tripeptides particularly counteract expression lines with an exponential effect on wrinkle reduction. COENZYM Q10: Coenzym Q10 acts as a radical-catcher and helps to prevent early skin aging, as well as wrinkle formation. SYN®-AKE: A synthetic version of a polypeptide fraction found in the venom of the temple viper (Tropidolaemus Wagleri). The synthetically produced anti-wrinkle ingredient is based on the same muscle relaxing effect as the original venom. The native snake venom protein, consisting of a long chain molecule, is too large to permeate the skin. The effect itself is spliced onto a smaller effective tripeptide molecule that is pliable for skin care products. Producing reduced muscle contraction and smooth facial lines within a short period of time. PHYTODERMINA H LIFTING: Phytodermina H Lifting assists to improve the skin surface, smoothens wrinkles and hereby provides new expressiveness. Phytodermina H Lifting contains Hydroxypropyl-beta-cyclodextrin (circular oligosaccharide). It´s produced by an enzymatic splitting of starch. This substance is a biotechnical product which makes minimizing or blocking of basis-smell or –taste possible. SYN®-HYCAN:SYN®-HYCAN is a patented, synthetic tri-peptide. It contains no preservatives. By SYN®-HYCAN, the body owned production of hyluronic acid and collagen can be increased and improved essentially. The skin can look younger, healthy and smoother. DEFENSIL® PLUS: Phytosterols from the balloon vine (cardiospermum halicacabum) prevents skin irritation and inflammation. The essential fatty acids of the Echium-extract (Echium plantagineum) protect and strengthen the skin barrier. Excerpts from sunflower oil are rich in skin-related phytosterols and vitamin E.
PROVITAMIN B5: Provitamine B5 increases the ability of the skin containing moisture and has nurturing characteristics to improve the elasticity. It supports the re-creation of skincells and hereby assists the regeneration. Moreover, Dexpanthenol has itchiness easing, anti-inflammatory and wound healing abilities. Ultra-light fluid with a potent skin care formula: AquaPront® refines pores, reduces wrinkles and reveals a spectacular skin profile. Reinforced by plankton microorganisms, Re-fine has a smoothing and anti-inflammatory effect. Extracts of green micro-algae deliver a valuable contribution to cell regeneration and sustain collagen and elastin for a well-established skin tone. Re-fine, the revolution of refined and visibly youthful skin! Apply 1-2 dosage units mornings and evenings, prior to your usual care. AQUAPRONT®: AquaPront® verfeinert die Poren, reduziert Falten und führt so zu einem ebenmäßigeren Hautprofil. EPIDERMIST 4.0: Epidermist 4.0, welcher aus Plankton-Mikroorganismen gewonnene marine Exopolysaccharide enthält, kann einen glättenden Effekt auf die Hautstruktur haben und zur Reduzierung der Porengröße beitragen. Epidermist 4.0 kann das Bakterienwachstum regulieren, Entzündungen reduzieren und somit die Zellerneuerung verbessern. DERMOCHLORELLA DP: Dermochlorella DP, an extract from the monocellular green microalgae Chlorella vulgaris is able, to maximize the firmness and the skin-tonus by stimulating the collagen and elastinsynthesis. By its angiogenesis-blocking characteristics, it is possible to reduce the extent of small blood vessels and so contributes an even more symmetric skin profile. BETAINE – SUGAR BEET EXTRACT: A polysaccharide compound obtained from sugar beet juice with an exceptional water-binding capacity. Improves the overall skin feel. An excellent anti-aging product that moisturizes, nourishes and protects against mechanical and chemical skin damage. PROTEC CM GLUCAN: CM – Glucan is a Polysaccharide, gained from yeast. It´s able to push the wound healing, skin irritations are reduced, and skin owned protection functions are lifted, as well. SWEET ALMOND OIL: Prunus amygdalus dulcis, Rosaceae is gained from the seasoned seed of the sweet almond. The fat oil mainly consists of fat-acid glycerides. Almond oil is knows as very endemic, and recommended for the care of sensitive, dry and flaked skin.